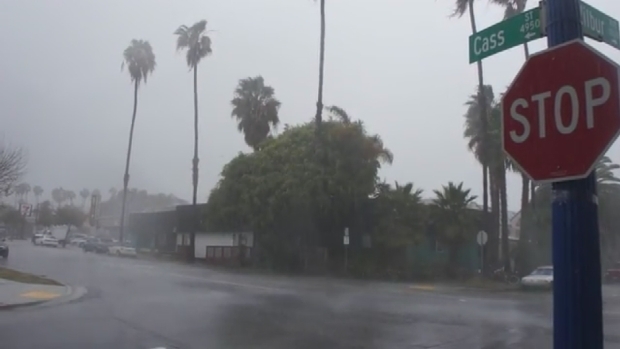 Roads were washed out, trees toppled, sinkholes formed and residents became trapped as strong El Niño storms swept through San Diego County Tuesday and Wednesday. San Diego lifeguards worked swiftly to rescue people from rising water. One of those rescues took place Wednesday at Miramar Road and Cabot Drive, where lifeguards rushed to help four to five cars with people trapped inside. The California Highway Patrol issued a Sig Alert for the 8100 block of Miramar Road as they continued rescues. One elderly woman was taken to the hospital for unknown injuries, and an SDG&E transformer had to be covered until crews could deal with possible water damage. This raw video shows deep flooding that trapped vehicles on Miramar Road. Lifeguards had to go in and rescue some of the victims. Other rescues were necessary at Roselle Street near Sorrento Valley and Ward Road in Mission Valley. In Sorrento Valley, a partial roof collapse at a FedEx building forced an evacuation of the building, San Diego Fire-Rescue Department (SDFD) spokesman Lee Swanson said. Two employees were below the collapse, and both were not badly injured. Structural engineers were sent out to assess the damage. As high tides crashed against the shore, lifeguards closed the Ocean Beach Pier, they said. They will inform the public once it is open again. A visiting professor at UC San Diego bravely went on with a vector calculus lecture as water flooded into his room. "His actions are a testament to the dedication of UCSD's faculty," wrote student Tony Murillo, who captured video of the scene. "P.S. He did end up letting us out early." 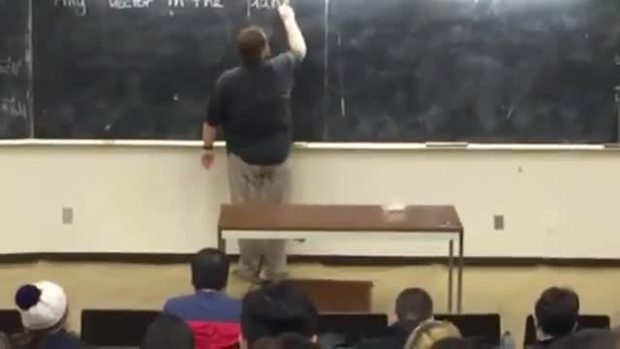 Video via Tony Murillo: "Kenneth Barrese, a visiting professor at the University of California San Diego (UCSD), casually continues on his Vector Calculus lecture despite a tornado advisory and serious flooding in the room. His actions are a testament to the dedication of UCSD's faculty. P.S. He did end up letting us out early." In La Jolla Shores, a sinkhole opened up Wednesday, growing near Avenida de la Playa and Camino del Oro. The hole, which is larger than a car, is exposing a gas line, according to San Diego Gas and Electric. The line connects directly to the La Jolla Shores Hotel. The utility said the gas line is intact, but one of the big slabs of concrete could rupture it. Ocean water could be seen washing in and out of the hole. Many people use the road to access the beach with their boats and kayaks. Officials say the area should be avoided altogether until the sinkhole can be repaired. Farther inland, rains continued to pound on San Diego County's dry land, loosening dirt and rocks in the Valley Center area. At about 8:15 p.m., the water brought down heavy boulders, weighing approximately 1,000 pounds, onto Old Castle Road, blocking both lanes. No one was injured, but crews had to use a skiploader to clear the roadway. The CHP says there is no indication that the rocks permanently damaged the road. The debris was cleared by 9:37 p.m.
Lakeside residents told the CHP the flooded area at Valle Vista Road and Lakeside Avenue appeared to be sinking at 5:30 p.m. Lakeside officials were responding to determine if that is true, as the water was not receding quickly. The fast moving water brought debris and large rocks into the road. In Poway Wednesday afternoon, a man driving along a street was startled when a tree toppled over onto his car. He pulled over at Country Creek and Tierra Bonita roads. "It started to get a little bit windy, and then bam! The tree just fell right over across the front of the car," he said, considering himself lucky that he was uninjured. 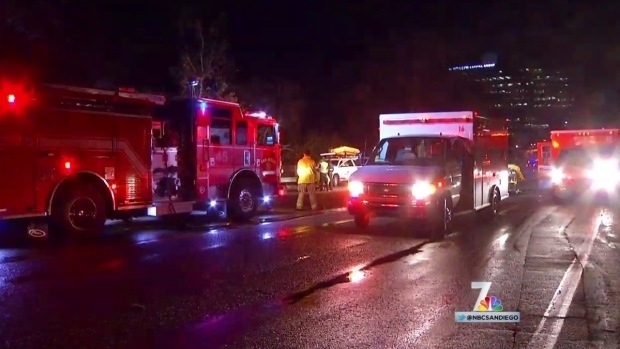 From midnight Wednesday to 6 p.m., California Highway Patrol (CHP) received 140 reports of collisions. On average, 140 crashes are reported on a day with good weather. Strong winds whipped through Vista Wednesday at about 4:30 p.m., damaging eight houses and knocking out power to the area. In one yard off Civic Center Drive, a gust snapped a 60-foot eucalyptus tree in half. Thankfully, the broken tree did not hit the house. On Tuesday night, the rushing water was too much for one apartment complex in the Mid-City area to handle. That complex, on 48th Street, sustained major flooding that displaced many residents. The flood waters even drowned one resident’s pet dog. On Wednesday morning, residents still had a lot of clean-up left to tackle. Some residents waded waist-deep in water, trying to start the clean-up process. Most of the flooding was in a parking garage, where water submerged about a dozen vehicles. The water also caused damage to some apartment units. Resident Jeff Napier told NBC 7 everyone at the complex managed to get out unharmed, with the exception of a neighbor’s Chihuahua. At an apartment complex on Trojan Avenue in City Heights, residents took advantage of a break in rain Wednesday morning to prepare for more flooding. "We've lived here almost nine years and it's never done this," said Steve Chase. "This is the worst rain ever." By 4:30 p.m. Wednesday, the roads in front of the complex were filled waist-deep with water once again. NBC 7's Greg Bledsoe and NBC 7's Matt Rascon report live from across the county, where some roads have flooded amid heavy rain. Carlos Jimenez had to call a tow truck to bring his car to higher ground in City Heights. "Well I was just trying to save my car because I was going to go to work," he said. "But I couldn't because my car was floating." Over in Mission Valley, several people were dealing with damaged cars after a parking structure flooded at Fashion Valley Mall. The water at Parking Structure C was all the way up to the middle of the doors of some vehicles parked there. Due to flooding in the area stemming from the San Diego River, some roads to the back portion of Fashion Valley Mall, near the movie theater, were closed Wednesday morning. This included Avenida del Rio and Camino De La Reina. In Point Loma, some residents on Scott Street experienced flooding to their homes and found themselves knee-deep in water. The water rushed an apartment complex in the area with such force, it knocked a fence outside the complex off its hinges. At least six homes on Scott Street in Point Loma sustained damage from floods amid heavy rain storms. NBC 7's Liberty Zabala speaks with residents about the messy, frightening ordeal. Point Loma residents, including Kim Callahan, told NBC 7 the flash floods submerged their street in less than 10 minutes. Callahan, along with residents in at least six other homes in the area, were temporarily displaced by the flooding as clean-up efforts continued well into Wednesday. 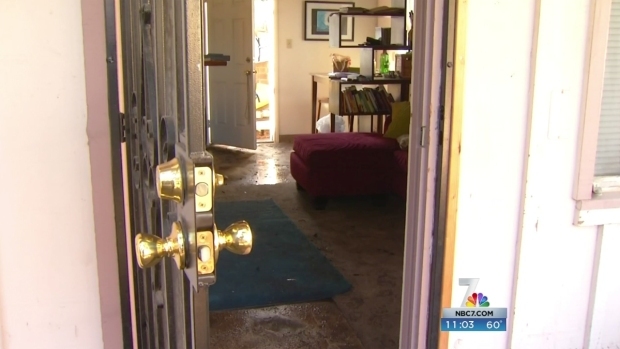 Resident Kelly Fouquier told NBC 7 the water got so high in her Point Loma home, firefighters had to pull her out from a window. She said the ordeal was extremely frightening, to say the least. "Literally, it's probably the scariest thing I've ever been through in my entire life. I've never experienced anything like that; any type of disaster like that," she explained. "I was really, really scared." 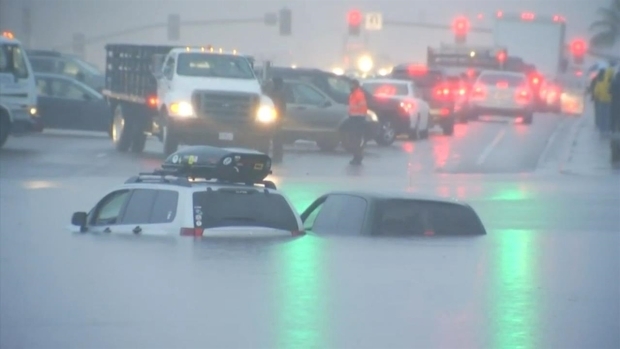 Drivers in Point Loma were also stuck in rising flood waters on the roadways Tuesday night. Amid the strong storms, two men had to be rescued from the San Diego River in Mission Valley. NBC 7's Steven Luke reports. Meanwhile, due to damage caused by the storms, the County of San Diego Health and Human Services Agency (HHSA) announced it had temporarily closed the Rosecrans Health Services Complex located at 3851 Rosecrans St. in San Diego on Wednesday. HHSA officials said the closure of the Rosecrans facility is not expected to result in the postponing of any services, and services provided at that location are available at other County Public Health Centers throughout the region. 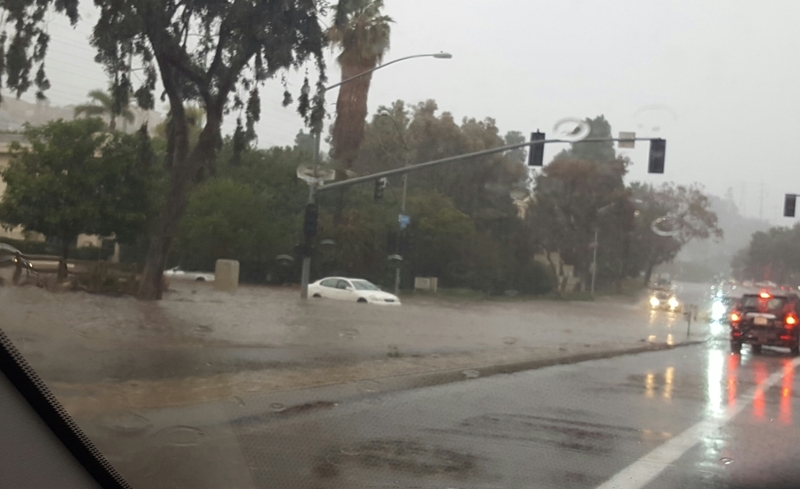 On Tuesday night, many drivers across the county battled flooding on roadways, including in Kearny Mesa, where water levels surged to three feet in a matter of minutes, trapping drivers on Balboa Avenue, read Off Road Warehouse. Elias Hanna, a Baja 1000 champion off-road racer who works at Off Road Warehouse, sprang into action in that area and helped rescue drivers trapped in the raging flood waters. In Mission Valley, lifeguards launched a difficult rescue Tuesday night to pull two men from the San Diego River off Interstate 805.